Navy is back, and it’s not the nautical-themed, prep school staple you remember. The new navy blends old-world elegance with contemporary patterns and playful pops of color for a look that’s anything but traditional. Whether you’re hunting for a fresh neutral for your yet-to-be-determined baby boy or girl or just hoping to trade in the typical pink or blue motif for something with a little more staying power, navy may be just the color you’re looking for! Pair with pastels for a soft, sophisticated look, or go bold with bright orange, yellow or green accents. Whatever palette you choose, don’t forget to add a little sparkle. Nothing makes navy look richer than a touch of silver or gold! Need a little inspiration? This collection of navy nurseries is sure to get your imagination rolling. Contemporary pattern play and rich navy and gold accents make this galaxy-themed nursery shine. A sophisticated accent combo of navy blue and coral, elegantly enhanced with a touch of gold. 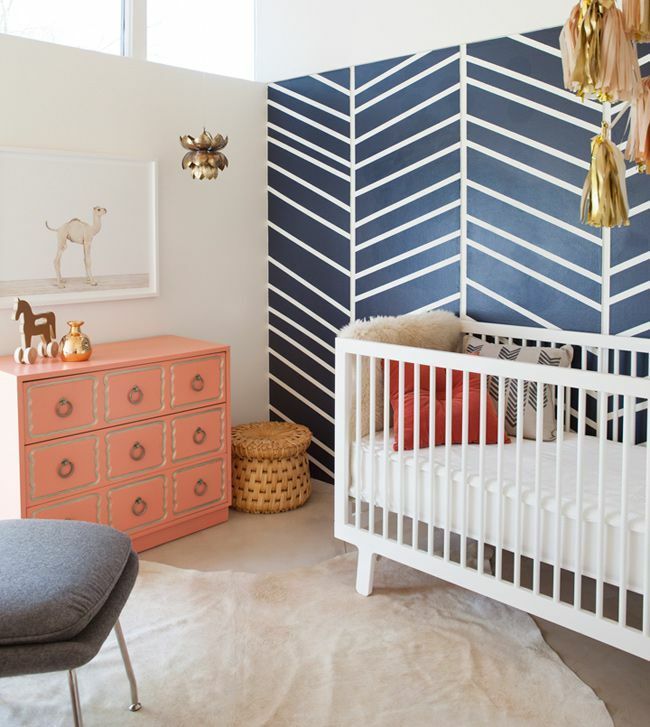 Another take on the popular navy and coral palette, this color-saturated nursery balances it's predominately navy palette with plenty of light and bright accents. Photo via Living in Andyland. This bold nursery makes a statement by contrasting solid navy with sunny yellow patterns. A pop of bright orange and a mix of well-coordinated patterns give this blue-on-blue palette some punch. Navy is the perfect compliment to a bold shade. This green and navy duo, tempered with clean, white panelling, has a fun, fresh look. Navy adds a chic edge to a pink palette, creating a space your little girl can grow into. Another bold pairing with white wood paneling and light blue accents. This beautiful nursery combines rich navy and teal with fresh pastels for a soft, neutral effect. A navy and pastel combo gives a classic nautical nursery theme a new look.